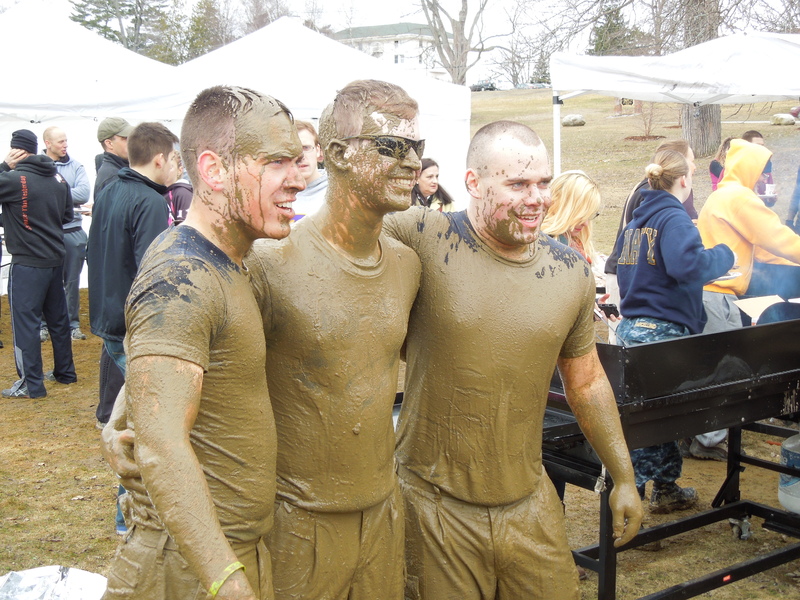 Competitors pose after completing the 2013 Zimmerman Challenge. Several years ago I was visiting my daughter at her off-campus apartment in Orono near the University of Maine. She left for an afternoon class and I was passing the time reading a book on the coach in her living room when all of a sudden I heard a loud noise. Two well-built young men without shirts and waving swords burst through the front door hollering my daughter’s name. When they passed through the kitchen and into the living room their bravado quickly faded to a sort of surprise and embarrassment. These two young men were her next door neighbors, Navy ROTC classmates, and her close friends who I had met several times over the years. I knew it was just prank and I was just as sure Becca and her roommates found similar ways to surprise the guys next door. Rebecca and James graduated later that year. She went off to Naval aviation training in Pensacola and he to Marine Infantry Training. His roommate Rob graduated the following year and was sent to learn how to lead a tank crew. They grew up quick and were proud to accept the responsibility of being military officers. Both James and Rob would be sent to Afghanistan with there respective units within a couple of years of their college graduation. Sadly, Lt. James R. Zimmerman was killed by a sniper while conducting combat operations in the Helmand Province on November 2, 2010. He was 25 years old. He had wanted to be a Marine from the time he was a boy growing up in Northern Maine. The Navy ROTC unit where James, Becca, and Rob met one another and became fast friends, wanted to do something to honor their fallen classmate and keep his memory alive. They came up with the idea to create the Zimmerman Fitness Challenge. Lt. Zimmerman was serious about being in top physical condition. He was constantly working out so that he would be well prepared for his future position as well as to set an example for the younger students in the program. There were few that could keep up with him and he earned the respect and admiration of others for his dedication. The Fitness Challenge was a perfect way to remember James while raising money for a ROTC scholarship in his name at the University of Maine. This entry was tagged Afghanistan, fallen heroes, Fitness, Marines, Navy ROTC, University of Maine, Zimmerman Fitness Challenge. Bookmark the permalink.